I enjoy living like a hermit, but I cannot live like a hermit. As part of reviewing Hermits On Holiday the rather wonderful new record from Drinks, we were forced to admit to ourselves that we only had a vague understanding of the term hermit. In literature and music they seem to always be shrouded in negativity, tales of strange bearded men in distant log cabins. Living their strange, mysterious lives outside of society’s norms. In reality of course, to be a hermit is just to take yourself away from the world, to live a life of seclusion. Which frankly, don’t we all want to do sometimes? Hermits have regularly been referenced in music, perhaps most obviously by the band Herman’s Hermits, who were neither hermits nor made any reference to hermits in their music whatsoever. More actually about hermits or recluses was The Wind by PJ Harvey, a track which saw Polly Jean recount the tale of Catherine who was once “a lady of the city” but now lives “in a chapel way up on the hill.” For some reason our PJ was desperate to get her a husband, ideally a rich one at that! Of course as well as many musicians who are interested in the life of hermits, there are plenty of musicians who’ve also chosen the lifestyle. Captain Beefheart famously retired from music and disappeared from the public eye all together, whilst Axl Rose rarely left his Malibu mansion in the late 1990’s. However, probably the most famous example of a musical recluse is Syd Barrett. Syd was involved in arguably the best bits of Pink Floyds output, and after he left in acrimonious circumstances- including a memorable moment attending a Pink Floyd show purely to glare at David Gilmour- he produced a few solo album, but then gradually grew into himself and eventually sold the rights to his solo records and moved into a London Hotel to live alone eventually, he ran out of money and moved back to Cambridge, deciding to make the fifty mile journey on foot! Syd’s final public appearance was in the mid-1970’s and he rarely ever acknowledged his musical past. In a world where solitude is increasingly impossible to find, and celebrities are expected to be so open and omnipresent, perhaps more and more people are going to choose the solitary life of a hermit. Although perhaps like Drinks they’ll need the odd holiday into what most of us have decided to call the real world. There is a type of traditional Indonesian ensemble music known as gamelan. In gamelan, instruments are normally played in pairs, two instruments tuned slightly away from one another producing interference beats. This trick is repeated across the orchestra with the aim of producing a phenomenon known as ombak, or to roughly translate, wave. The idea being that the music undulates, the slightly higher note inhaling, the slightly lower exhaling. Gamelan is a music where one person’s sound and melody cannot exist without the melody of another, the same could be said for the new record by Drinks. 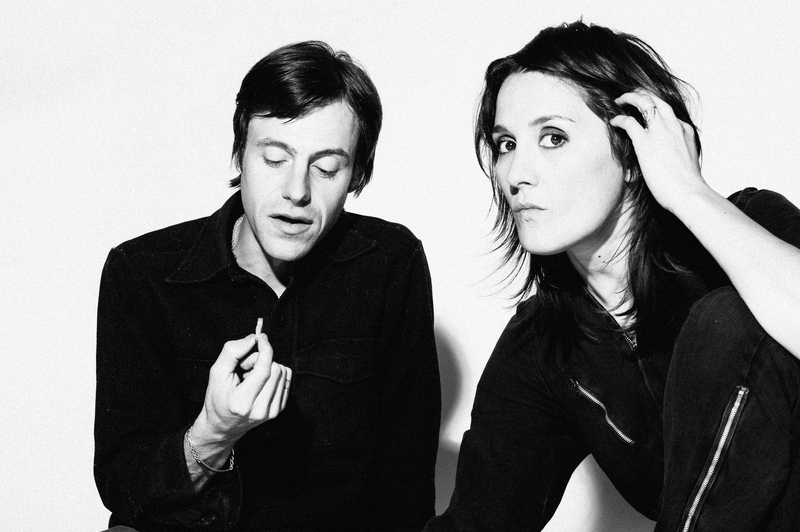 Drinks may on paper be a collaboration between Welsh singer-songwriter Cate Le Bon and San Franciscan Tim Presley best known for his work with White Fence, but they see this project differently: a solo project with “one mouth, one set of lungs, one mind and four legs”. If the description sounds confusing just wait until you hear the music. Minimalistic sketches of songs, repeated simplistic guitar phrases, lyrics that seem to go rapidly from the profound to entirely surreal and instruments floating in and out of songs. The songwriting in one moment is seemingly formless and unstructured, then the next moment coming together into a wonderful moment of cohesion. There are reference points, in the work of Liars, Vic Goddard, The Velvet Underground, but rarely do they stay long enough to actually remind you of anyone in particular. If it recalls any moment in musical history it’s probably the post-punk era of the late 1970’s, when punk was it’s most boundary pushing and avant garde. When it was expressive, adventurous and borrowed from everything. There’s elements of free jazz, of the simplistic playing of the most ragged Indie-Pop acts, of Krautrock and even disco, and they’re mashed together into tracks that could loosely be termed songs. The title track, Hermits On Holiday is probably the best jumping off point. A bouncing electric guitar riff, the almost random percussive notes delivered by a wood block, and Cate’s always stunningly clear voice, reminiscent of a heavily Welsh accented Nico. It’s very nearly a pop song, in the mould of Talking Heads or Gang Of Four, but they seem to almost gleefully destroy that, the lyrics are verging on complete gobbledygook, “half past the day making hay” or “I want to be lonely, feeding time, feeding time, feeding time.” As if they were so worried someone might call them accessible they threw them on as an afterthought. It’s still the most accessible and in some ways enjoyable moment here. The other great moments here are when they really go all out into the world of experimenting, when they fully embrace the oddness. On the excellent Tim, Do I Like That Dog, which is just six and a half minutes of feedback laced guitar soloing, clattering drums and Cate’s persistent questioning, “Tim, Do I Like That Dog?” “that one that dog?” Tim only occasionally breaking from his guitar thrashing with flippant comments “I don’t know”, “Lemon that’s his name, the dog”, “you say you like big dogs but I think a small one, is that true?” It ends with them taking it in terms to just say dog. It is exactly as bizarre, hilarious and brilliant as it sounds. Spilt The Beans, a trippy psych-influenced track, built around a singular beautifully delivered and repeated lyric, “windows in my house, ruined me, spilt the beans, tidal.” Is notable largely for a piano part that sounds like it was played whilst someone was falling down a flight of stairs, and some actually rather lovely sounding guitar lines that sounds simultaneously meticulously planned out and not thought through at all. Laying Down Rock is just a repeated guitar phrase and a jangling acoustic guitar, overlayed with Tim’s slightly transatlantic drawl. Focus On The Street is a hectic blast of distorted guitar wailing; it ends aptly with Tim asking “what’s going on?” a question many people will ask at moments during this album. It’s an album that probably only truly makes sense to the combined mind of Tim and Cate, and that somehow makes trying to work it out an even more intriguing prospect. The artwork for Hermits On Holiday is a Picasso like cubist sketch of the pair, but the music they make would probably sit more comfortably alongside surrealists. It is music that is surprising; an unexpected juxtaposition of sounds and styles, at once challenging and jarring. The basic ideas of popular music as we know it sliced and dissected into something that only sporadically represents songs. It’s a thrillingly different and intriguing listen, it will split opinions, but isn’t that always the case when someone is doing something truly unique? Hermits On Holiday is out August 21st via Heavenly Recordings. Drinks play End Of The Road Festival before embarking on a full UK tour in September.